‘ 3 Idiots’ the Bollywood blockbuster starring Aamir Khan has its closing scenes depicted in Ladakh, in all its glory. A traveler’s paradise, the Annual Ladakh festival is celebrated in September.Tourists visit this pristine land for its untouched beauty and clear waters. This annual event has the local communities and the district administrations of Leh and Kargil come together with a single goal. 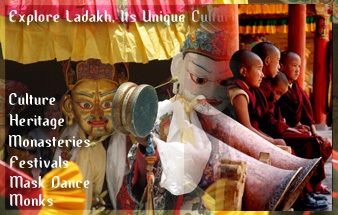 Revive the richness, depth and pageantry of Ladakh’s centuries-old culture .Promote the traditions and folk heritage for worldwide appreciation and recognition. Tourists visiting Ladakh have a perspective into the lifestyle and cultural ethos of the locals. The “Ladakh Festival Cup” has polo teams from different parts of the region participating for the coveted cup. The Annaul Archery festival tests accurate archery skills of the participants. The evening musical concerts with mask dances by lamas of selected monasteries are what sets the Ladakh festival apart from the other festivals. The Brok Pas cultural programmes are held in the Zanskar Valley. The traditional sport “Saka”, has colorfully dressed horses competing to stay ahead in the race. Visit Indian Eagle for Lowest Airfare to stay ahead and book early. Check our Online Deals which are the Lowest Airfares Guaranteed.